FREE for a limited time! Overdrives patch for the Line 6 HX Effects and Helix. Six drives meticulously dialed in for modern worship music. These drives are set up to hit an amp that is right on the verge of breakup – meaning when no drives are engaged, you should be able to hear a bit of grit on your amp when you dig in on your bridge pickup. All the drives are low gain – they’re designed to push the amp into overdrive. The biggest sounding drive in this patch is the OCD. Stacking drives will get you bigger sounds, and stacking one of the drives with the OCD is great for a lead tone. Remember that as you start stacking gain, your signal will become more and more compressed, and if you stack too much, it’ll just turn into mud. We recommend no more than three at a time. Why did we make a patch of just drives? This patch is part of our ‘Building Blocks’ series – a collection of patches you can use to create a database of effects sounds. The idea is you can have a collection of drives that are specifically dialed in for praise and worship music that you can pick from to build your own patches. 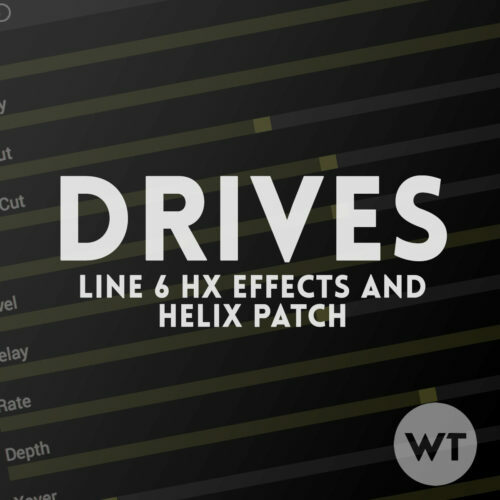 You can leave this patch in your HX Effects or Helix, and then copy/paste effects blocks from it into your own patches to create exactly what you want.